(Cohotate 8 March 2002 - 01) The winter of 2002 was exceptionally mild with no snow cover remaining the beginning of March. On the 8th the outside temperature at 11:00 AM was 50 degrees, so we decided to take a short field trip to Cohotate Preserve to see if spring was arriving early. We stopped along the entry path to look at this mature shagbark hickory tree (Carya ovata) with its characteristic partially peeled bark. (Cohotate 8 March 2002 - 02) The ice had left the pond allowing the soft breeze to produce little ripples across the reflective surface of the water. The remnant of last year's cattails remained standing, partially fencing in the shore line. The stage was set for the new spring growth, but we could not spot any around the pond. (Cohotate 8 March 2002 - 03) There were, however, several "forests of green" visible as we began to head down toward the Hudson River. 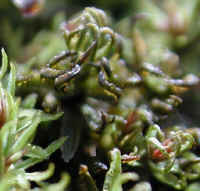 We had not entered the "twilight zone" or some primeval jungle; we simply had an ant's eye view of a patch of sphagnum moss sending forth its new growth. 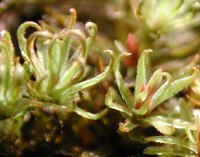 (Cohotate 8 March 2002 - 03a) This is an even closer look at the unfolding "branches" of the sphagnum moss. God's creation is marvelous to behold, and there are many beautiful things easily seen; but the miniature ones, like this one, that are so often just out of sight, are worth the extra effort to find. 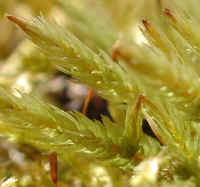 (Cohotate 8 March 2002 - 04) Like an old giant evergreen tree towering above the forest, this sphagnum moss spreads its branches nearly 1/4 inch above the surrounding moss. 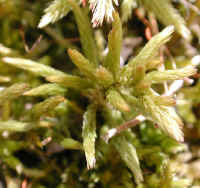 (Cohotate 8 March 2002 - 04a) In actual size, this photo of sphagnum moss measures about 1/4 inch across. As with the expression, "take time to smell the roses", we believe it's important to take time to truly observe the world around us, even in this detail, for in doing so, we hopefully will come to the conclusion that our environment and life on earth is worth preserving. 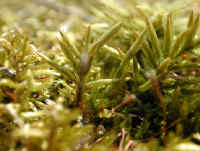 (Cohotate 8 March 2002 - 05) In this photo, we're looking down upon the new growth of sphagnum moss. 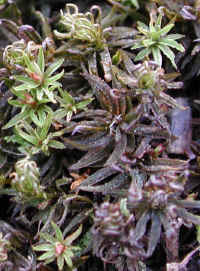 (Cohotate 8 March 2002 - 06) This is another enlarged top view of the new growth of sphagnum moss. (Cohotate 8 March 2002 - 07) Is it shrubs growing from a rocky outcropping? No! 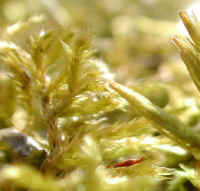 It's sphagnum moss growing on the bark of a tree. 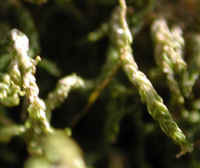 (Cohotate 8 March 2002 - 08) Strands of sphagnum moss hang down from the patch growing on the bark of a tree. 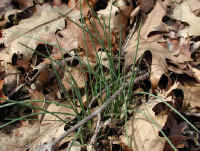 (Cohotate 8 March 2002 - 09) As they rose from their winter slumber, small patches of chives stretched their green "arms" above the brown earth. For them, spring had arrived! 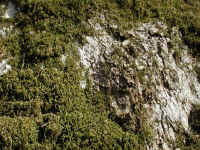 (Cohotate 8 March 2002 - 10) This patch of lichen was growing with moss on the trunk of a tree. 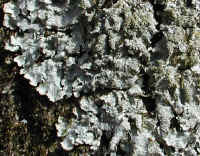 This Crustaceous lichen is a hardy common variety, which like all other lichens, has no roots, stems, or leaves. (Cohotate 8 March 2002 - 10a) Crustaceous lichen gets its name because it is said to look like little shells. 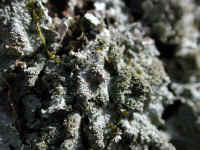 Lichen is made up of an alga and a fungus growing in a symbiotic association on the surface of a rock or tree. In this plant partnership the green alga manufactures the food and the fungus absorbs and stores the water. If only we humans could learn to live together for our mutual benefit and survival without enslaving and killing each other and the animals! 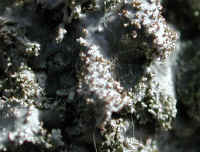 (Cohotate 8 March 2002 - 11) In this enlarged photo, the lichen can be seen forming "colonies". 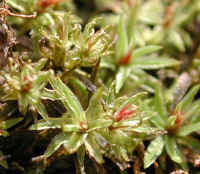 In the upper left of the photo, a "strand" of sphagnum moss can be seen hanging down over the lichen. (Cohotate 8 March 2002 - 11a) In this further enlarged photo of the crustaceous lichen, the interrelationship of the algae and fungi becomes clearer. This is another excellent example of the intricate detail and planning that went into God's creation. (Cohotate 8 March 2002 - 12) The remains of what we believe to be last year's Polyporus frondosus were growing on this decaying log and branch. If we are correct in our identification, it is an edible mushroom. (Cohotate 8 March 2002 - 12a) This is a closer view of one of the clusters of these polyporus mushrooms. They seem to have lost most of their color due to weathering over the winter. 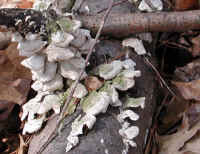 (Cohotate 8 March 2002 - 13) One of the identifying characteristics of the polyporus frondosus is the way individual mushrooms grow from branches. 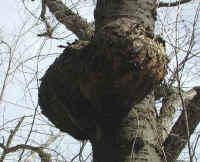 One of the branches can be seen in this photo. 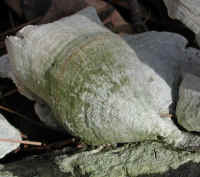 (Cohotate 8 March 2002 - 13a) In this photo of a polyporus mushroom, we can see some of the remaining color and texture. (Cohotate 8 March 2002 - 14) This is another photo of one of the polyporus mushrooms. 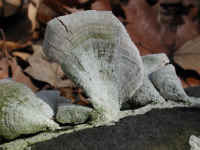 Note the way the mushroom grows from the branch which runs along the surface of the decaying log. (Cohotate 8 March 2002 - 15) Sometime in the past someone had cut a tree into pieces, and this piece found its way into the the Hudson River to become driftwood. 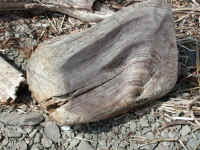 The shore line of Cohotate Preserve is lined with driftwood. We have noticed that the driftwood does not seem to decay as fast as the wood of fallen trees, which causes us to wonder if the water's action upon the wood acts as a preservative. (Cohotate 8 March 2002 - 15a) As this piece of driftwood dried and was bleached by the sun, the grain became very pronounced with a somewhat polished looking appearance. (Cohotate 8 March 2002 - 16) Even last year's stand of dry grass adds beauty to the Hudson River shoreline. (Cohotate 8 March 2002 - 17) There are several small drainage streams on the hill side leading down to the Hudson River. This little rivulet caught our attention. 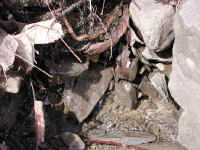 (Cohotate 8 March 2002 - 18) We had to do more than simply acknowledge that the water was flowing down the drainage ditch; we had to take a closer look. While we find beauty in all of nature, we find a special beauty, when we look more closely. 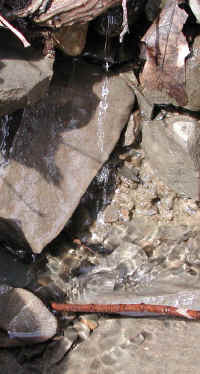 There is beauty in the way the water flows off the stones, as seen in the upper part of the photo. The falling water first begins to twist and then to "clump" together as a preparation for its break-up, but the fall here is too short. There is beauty in the way the water flows into the small pool, forming little ripples that cast interesting sunlight and shadow patterns on the sand and gravel at the bottom of the pool. We should never get so busy that we fail to enjoy the beauty of God's creation, for it brings peace to our mind, soul, and spirit. 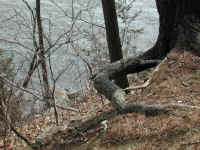 (Cohotate 8 March 2002 - 19) This unusual exposed root of an old tree perched on the side of the hill overlooking the Hudson River caught our attention. 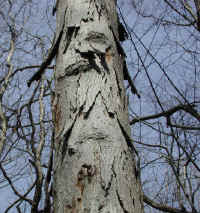 (Cohotate 8 March 2002 - 20) The horizontal lines on the bark of this tree lead us to believe that this is a black birch with two burls projecting from the west side of the trunk. These wart-like growths are sliced to make a veneer known as "burlwood veneer". (Cohotate 8 March 2002 - 21) As we were completing our hike through Cohotate Preserve, we spotted this patch of what appeared to be moss, but we were not able to identify it. (Cohotate 8 March 2002 - 21a) This is a further enlarged view of this unknown "moss" which shows the contrast between the remains of last year's growth and this year's new growth. 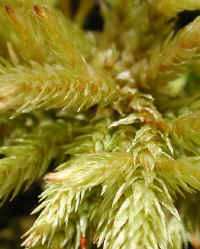 (Cohotate 8 March 2002 - 22) This is another enlarged close-up of this unknown "moss". 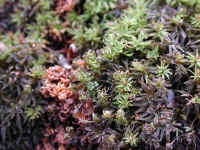 (Cohotate 8 March 2002 - 23) Because we were intrigued by this unusual "moss", we took this side view photo of the plants to help in its identification. If you can identify it, please contact us. (Cohotate 8 March 2002 - 24) As we approached it, this "moss" looked green, like other moss; but as this photo reveals, it has a wide variety of colors.